Specialising in a range of services for customising and restoring cars. The venture began when partners Rene Pedersen and Michael Rust (Rusty) worked on Reneâ€™s â€™67 Chevy Impala after-hours and on weekends. 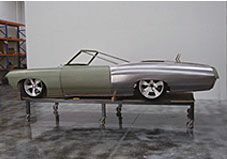 Recognising the lack of custom shops, they opened Bayside Customs and now combine their lifelong passion for custom cars with their abilities to provide the highest quality services. In addition, Rusty draws on more than 15 years in the industry. Customising a car can involve a broad range of factors, and itâ€™s important to identify them from the beginning. 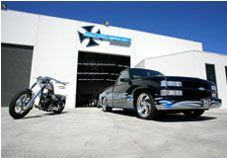 At Bayside Customs we spend the time up front to focus on exactly what you want, from overall concept to specific details. 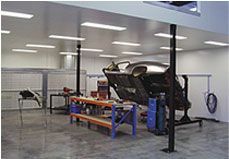 Together we consider the intentions for your car, budget and estimated time of completion. As appropriate, we communicate with you throughout the process so you can be assured we are meeting your expectations. We offer services in a wide spectrum of restoration and customising, including vintage cars, hot rods, show cars, muscle cars and classics. We can also assist you by arranging concept drawings for your project. You are welcome to stop by or contact us to discuss your dream.